In the early decades of the 20th century, a baby girl was born to German parents in Ukraine. In 1957, that baby girl, now grown, immigrated with her family to the U.S. from Germany. In 2014, her granddaughter, Erika Weidemann, graduated from Pacific Union College with a degree in history, and has since won a number of grants, fellowships, and awards for her research on German-American history. 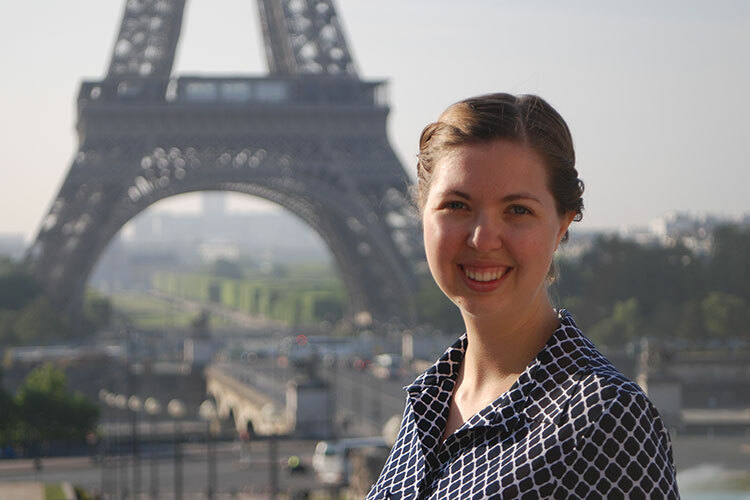 For her dissertation, titled "A Malleable Identity: The Immigration of Ethnic Germans to North America, 1947-1957,” Weidemann received research grants from the Glassock Center for the Humanities, the Society for German American Studies, and Texas A&M University. These competitive grants ranged from $500 to $5,000 and were awarded for the significance of her research topic. Weidemann also won the Keeble Dissertation Award, given to the best dissertation project in the history department at Texas A&M, the German Script Award from the Quadrangle Historical Research Foundation for her work with German primary sources, and the Fasken Research Award, given to those who combine excellent research with a passion for teaching. Weidemann first began studying immigration from Germany to North America in the post-World War II period when she wrote her senior thesis on the topic while at PUC. She then used that paper as the basis for a seminar paper in her master’s program and it is now her doctoral dissertation. She focuses specifically on the experience of ethnic Germans who had been living in the Soviet Union; her dissertation is a comparative study of ethnic German immigration to the U.S. and Canada, and the role that religious affiliation and voluntary organizations had on immigration destinations. To conduct her research, Weidemann visited archives in both large cities and tiny villages in France, Canada, Germany, Pennsylvania, Kansas, North Dakota, Washington, D.C., and New York City. She also met individuals who experienced what she writes about. With immigration as a hot topic across the nation right now, Weidemann can’t deny her research, despite focusing on the past, has informed her view of current events and policies regarding immigration to the U.S.
First, Weidemann says, it is very difficult to immigrate to America. Secondly, Weidemann says her research has reiterated what she and many others already believe: we need to treat immigrants with love and respect. The third lesson Weidemann extracted from her research is both the individual and the organization is a powerful tool for change. On the other hand, she points out, Church World Service—a still-operating cooperative ministry of 37 Christian denominations providing refugee and other assistance—only succeeded because thousands of individuals agreed to sponsor one person or one family. Weidemann explains that after World War II, Canada opened its doors to war refugees before America did. Weidemann believes her experience at PUC set her up for success in her research, preparing her well academically for graduate school, and providing her with mentors who continue to invest in her education. As a PUC junior, Weidemann attended the Association for Seventh-day Adventist Historians conference with the college’s history professors, where she presented a paper. Weidemann expects to defend her dissertation for her doctoral degree in May 2019, then hopes to begin teaching at university level in the fall. For more information on PUC’s department of history, visit puc.edu/history or email hmunson@puc.edu.